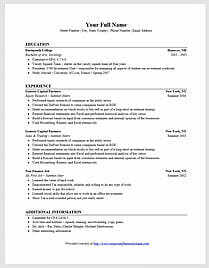 Below is a real example of a form that was used by investment banking professionals to hire new analysts and associates. The form includes the questions asked as well as the answer key. This is based on a real form used at bulge bracketBulge Bracket Investment BanksBulge Bracket investment banks are the top global investment banks. The list includes companies such as Goldman Sachs, Morgan Stanley, BAML, and JP Morgan. What is a Bulge Bracket Investment Bank and banks for their investment banking interview questions in the hiring process. Total Interview time: approx. 45 minutes. Welcome, introduce yourself & your position and thank interviewee for their time & interest. Clarify the time for the interview and explain that you may interrupt if necessary, etc. Provide an outline of what they should expect during the interview. Highlight areas to be covered. Mention you may take notes & give candidate permission for “thinking time”. Warm up by talking with the candidate about how great our bank is and brag about all our big transactions. Opportunity for the interviewer to question candidate about the work experience that is noted on their resume. This section of the investment banking interview questions provides insight into the candidate’s critical thinking skills. Answer: 29 days because, if it doubles in size each day it also halves each day. Thus at 29 days is half full in order to be completely full in 30 days. Answer: Switch on switches 1 & 2, wait a moment and switch off number 2. Enter the room. Whichever bulb is on is wired to switch 1, whichever is off and hot is wired to switch number 2, and the third is wired to switch 3. This section of the investment banking interview questions provides insight into the candidate’s technical knowledge of finance, accounting, valuation, and financial modeling. The balance sheetBalance SheetThe balance sheet is one of the three fundamental financial statements. These statements are key to both financial modeling and accounting. The balance sheet displays the company’s total assets, and how these assets are financed, through either debt or equity. Assets = Liabilities + Equity is a snapshot at a point in time. On the top half you have the company’s Assets and on the bottom half its Liabilities and Shareholders’ Equity (or Net Worth). The assets and liabilities are typically listed in order of liquidity and separated between current and non-current. The income statementIncome StatementThe Income Statement (or Statement of Profit and Loss) shows performance from operations of a business. The financial statement begins with revenues and covers a period of time, such as a quarter or year. It illustrates the profitability of the company from an accounting (accrual and matching) perspective. It starts with the revenue line and after deducting expenses derives net income. The cash flow statementCash Flow Statement​A Cash Flow Statement (officially called the Statement of Cash Flows) contains information on how much cash a company has generated and used during a given period. It contains 3 sections: cash from operations, cash from investing and cash from financing. has three sections: cash from operations, cash used in investing, and cash from financing. It can be calculated using the direct approach or the reconciliation approach. It “undoes” all of the accounting principles and shows the cash flows of the business. 1) The multiples approach (also called “comps”), in which you multiply the earnings of a company by the P/E ratio of the industry in which it competes (and other ratios). 2) Transactions approach (also called “precedents”), where you compare the company to other companies that have recently sold/been acquired in that industry. 3) The Discounted Cash Flow approach, in which you discount the values of future cash flows back to the present. Answer: [Note: Value = Cash Flow / WACCWACCWACC is a firm’s Weighted Average Cost of Capital and represents its blended cost of capital including equity and debt. The WACC formula is = (E/V x Re) + ((D/V x Rd) x (1-T)). This guide will provide an overview of what it is, why its used, how to calculate it, and also provides a downloadable WACC calculator]. Answer: There are many reasons to issue debt instead of equity: (1) It is a less risky and cheaper source of financing compared to issuing equity; (2) If the company has taxable income, issuing debt provides the benefit of tax shieldsTax ShieldA Tax Shield is an allowable deduction from taxable income that results in a reduction of taxes owed. The value of these shields depends on the effective tax rate for the corporation or individual. Common expenses that are deductible include depreciation, amortization, mortgage payments and interest expense; (3) If the firm has immediately steady cash flows and is able to make their interest payments; (4) higher financial leverageFinancial LeverageFinancial leverage refers to the amount of borrowed money used to purchase an asset with the expectation that the income from the new asset will exceed the cost of borrowing. In most cases, the provider of the debt will put a limit on how much risk it is ready to take and indicate a limit on the extent of the leverage helps maximize the return on invested capital; (5) when issuing debt yields a lower weighted cost of capital (WACC)WACCWACC is a firm’s Weighted Average Cost of Capital and represents its blended cost of capital including equity and debt. The WACC formula is = (E/V x Re) + ((D/V x Rd) x (1-T)). This guide will provide an overview of what it is, why its used, how to calculate it, and also provides a downloadable WACC calculator than issuing equity. Answer: Debt, Equity, Tax, Beta. See more on WACC hereWACCWACC is a firm’s Weighted Average Cost of Capital and represents its blended cost of capital including equity and debt. The WACC formula is = (E/V x Re) + ((D/V x Rd) x (1-T)). This guide will provide an overview of what it is, why its used, how to calculate it, and also provides a downloadable WACC calculator. Answer: This is calculated by taking the proportion of debt to total capital, times the debt rate, times one minus the effective tax rate, plus the proportion of equity to capital, times the required return on equity. Answer: About 15-20 times, the PE ratioPrice Earnings RatioThe Price Earnings Ratio (P/E Ratio) is the relationship between a company’s stock price and earnings per share. It gives investors a better sense of the value of a company. The P/E shows the expectations of the market and is the price you must pay per unit of current (or future) earnings varies by industry and period in the cycle. Part a) What is the impact on EBITDA? Part b) What is the impact on Net Income? Part c) What is the impact on cash flow? Part d) What is the impact on valuation? Issuance of debt increases after-tax interest expense which lowers EPSEarnings Per Share Formula (EPS)The Earnings Per Share formula is a financial ratio, which counts net earnings against the total outstanding shares over a fixed period of time. A higher EPS ratio indicates a company’s ability to generate profits for common shareholders..
Repurchase of shares reduces the number of shares outstanding which increases EPS. Whether it increases or decreases EPSEarnings Per Share Formula (EPS)The Earnings Per Share formula is a financial ratio, which counts net earnings against the total outstanding shares over a fixed period of time. A higher EPS ratio indicates a company’s ability to generate profits for common shareholders. depends on the net impact of the above two points. Building a financial model takes a lot of practices to be really good at it. The best financial models are clearly laid out, identify all the key drivers of the business, are accurate and precise yet not overly complicated, can handle dynamic scenarios, and have built-in sensitivity analysis and error checking. This section of the investment banking interview questions focuses on the candidate’s soft skills and personality fit in the firm. “Why do you want to work in investment banking? Or at this bank?” [this question is so common we made a separate page with a full answer to it hereWhy Investment Banking?Almost every investment banking interviewer will ask the question: why investment banking? I want to work in investment banking because it's the fastest way to learn financial modeling, valuation, Excel, and understand the nature of large corporate transactions. I'm aware the job has a strict hierarchy, very long hours]. Answers: Grade the interviewee based on how well they expand on their ideas. There are no right or wrong answers. The key is to determine the following: do they demonstrate maturity, are they comfortable with ambiguity, can they work as a team, do they have emotional intelligence, would they fit well in our culture, etc. See more behavioral interview questionsInterviewsAce your next interview! Check out CFI's interview guides with the most common questions and best answers for any corporate finance job position. Interview questions and answer for finance, accounting, investment banking, equity research, commercial banking, FP&A, more! Free guides and practice to ace your interview. Ask the candidate, Do you have any questions for the interviewer? About IB, about the firm, about the process? This is the end of the investment banking interview questions. Up next: read our investment banking associate interview questions.